Studio 2 is slightly smaller than studio 1 but is also a great space with wooden floors, mirrors and plenty of natural light. 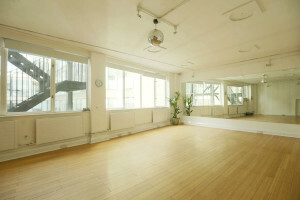 Perfect for castings, auditions, dance rehearsals, music rehearsals, meetings, actors readings, yoga, dance, photographic and film shoots, sample sales etc. We welcome clients from all creative and fitness backgrounds.